Before a customer makes a final decision on the right house plan or purchases blueprints, we are often asked how much it will cost to build a particular home. The experts at The House Plan Shop understand this is an important factor in making a final decision, as customers want to be sure they can afford to build the house of their dreams without going over budget. However, we know the costs for materials and labor vary greatly from one state to the next and sometimes even within the same city, making it impossible for us to provide an estimate for one of our house plans in any specified location. We can’t possibly know all the going rates for materials and labor all across the US and Canada. So, how can you get an estimated cost to build your desired home plan? We recommend checking with a few local builders or lumberyards. If you opt to check with builders, you can look in the phonebook, online or check with other family members and friends who have built a home in the past. Builders and the professionals at lumberyards deal with construction and materials costs on a daily basis and know the going rates for materials and labor in your particular area. Just ask for an estimated cost to build. Often, these professionals will quote a dollar amount per square foot. Be sure to ask what this quote includes as sometimes it will not include the heating and cooling system, foundation materials and a few other things. Checking locally is the best way to get an estimated cost to build for any of our house plans. We know it is a little more leg work for you, but, the estimate you obtain locally will be more accurate than any estimate we could provide because our estimate would be a guess. If you are ready to build a new house, but are challenged by a hillside lot, mountainous property or a lot that slopes in one direction, you’ll need to find a house plan suitable for a sloping lot. Perhaps you are building on waterfront property that slopes to a stunning lake or on steep and rugged terrain with a panoramic view. You’ll want to consider many of the house plans in our Waterfront Home Plan collection and those in our Mountain House Plan collection. 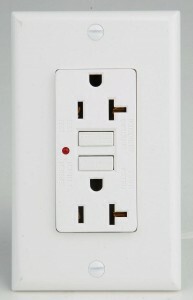 They are designed to accommodate sloping lots. Most of these designs are fashioned on a walkout basement allowing you to dig into the ground and create extra living space below the main level of the home. Furthermore, the walkout basement allows you to walkout out to your backyard or side yard from the lower level. Some of these designs offer drive-under garages using the lower level for parking and giving you the entire main floor for living space. In most cases, sloping lot house plans enjoy a view and feature large decks and porches as well plenty of windows oriented toward the view, taking advantage of the natural beauty of the property or lot. Sloping lot house plans are sometimes referred to hillside home plans and can vary in size and architectural style. They can be one or more stories and range from weekend cabins to luxurious primary residences. Many split-level home designs work well for front-sloping lots and incorporate at least a few stairs to access the front door. Take some time to browse The House Plan Shop’s extensive collection of home designs to find the right sloping lot home plan for you. Country house plans are designed to deliver an informal and relaxed way of life. At first glance, it is easy to see a country home plan and think of a rural lifestyle. And with some country homes, we may be reminded us of days gone past due to their old-fashioned farmhouse styling reminiscent of yesteryear. But, most present day country home designs are far from it! In fact, these designs incorporate many of today’s most up-to-date floor plan features and amenities suiting the needs of modern families. 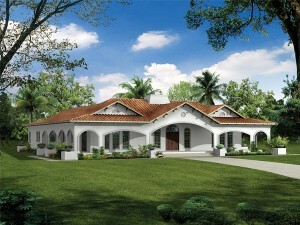 Country house plans are available in a broad range of shapes and sizes. They can range from a cozy country cottage, offering just the basics, to a sprawling luxury estate filled with state-of-the-art appointments. In addition, they can offer a one-story or two-story floor plan. Some even provide additional living square footage when built on a finished basement. 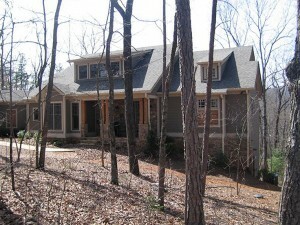 In many instances, country styling is blended with other architectural styles such as European, Southern and Craftsman. And let’s not forget the country house plan’s more elegant cousin, the Victorian design which features many country characteristics and is complemented with ornate details and trim. 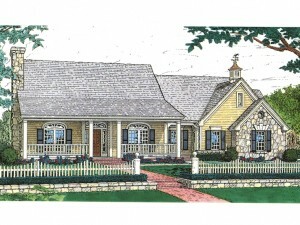 So if you’re looking for relaxed living in a pure country design or a blended style such as Country French, you’re sure to find the right home plan in The House Plan Shop’s extensive county house plan collection that will deliver the comfortable and practical family living you are looking for.